April 9, 2012: MarcoPolo-R is on Facebook: click here! February 25, 2011: MarcoPolo-R has been SELECTED for the assessment study phase of ESA M3 missions (Feb. 25, 2011). Click here to access the ESA announcement. MarcoPolo-R is a mission whose primary objective is a sample return from a primitive Near-Earth Asteroid, based along the lines of the former Marco Polo study mission, addressing a similar set of questions, many of which can only be answered by ground-based laboratory analysis, but with a revised approach that reduces the original cost. The scientific objectives of a sample return mission were laid out in great detail in the original Marco Polo proposal and in the Yellow Book resulting from the assessment study phase (see Documents). MarcoPolo-R benefits from the heritage of three industrial studies and parallel instrument development work of the previous Marco Polo concept, and two dedicated industrial studies of the full MarcpPolo-R mission and two studies devoted to sample mechanisms. The MarcoPolo-R Yellow Book has been submitted for internal review to ESA on 15 November 2013. 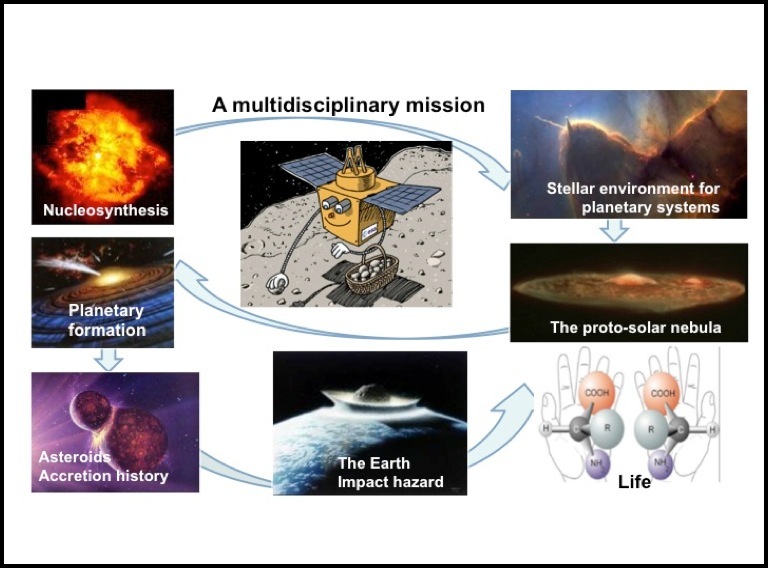 NEA sample return missions are considered high priority by a number of leading agencies, as demonstrated by the selection of OSIRIS-REx in the NASA New Frontiers Program for launch in 2016 and the JAXA Hayabusa 2 mission to be launched in 2014-2015. The exceptional target 2008 EV5 of MarcoPolo-R leads to a short mission duration of 4.5 years and the least demanding interplanetary environment than any previous ESA planetary mission. It is the cheapest sample return mission to a primitive body that can be achieved in the near future by ESA. The resulting mission offers Europe a unique opportunity to contribute in a very timely and significant manner to the international sample return and asteroid exploration activities. It will furthermore define Europe’s position as an equal and important player in future sample return endeavors to other Solar System bodies. 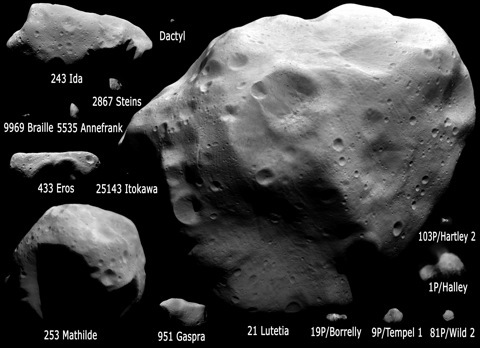 This figure shows all the images collected by space missions during fly-bys or dedicated visits to asteroids and comets. Regarding asteroids, only the 50 km-size Mathilde has a spectral type and albedo (0.03) consistent with primitive material. 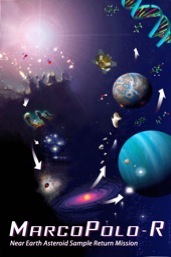 However, its size (and therefore gravity) is order of magnitudes above that expected for the kilometer-size target of MarcoPolo-R.
MarcoPolo-R has the potential to revolutionize our understanding of the properties of primitive material present in the Solar System and to shed light on the nature of small objects, essential steps to understand the primordial conditions responsible for planet formation and the emergence of life. Finally, it can provide us with important information on NEAs necessary to develop appropriate strategies to protect the Earth from potential hazardous impacts.